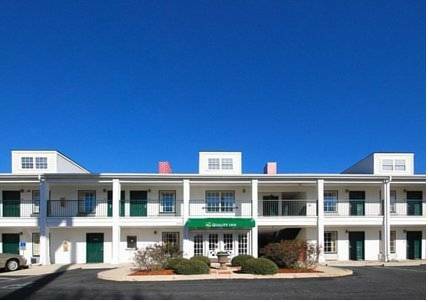 Get more for your money at the Quality Inn hotel in Lancaster, SC near the historic boyhood home of Andrew Jackson. We are located near the University of South Carolina Lancaster, Lancaster Golf Course, Crow's Nest Driving Range, Railway Museum and more. Get more value with amenities like free breakfast, free WiFi, a seasonal outdoor pool, a meeting room and a copy and fax machine. Rooms include a flat-screen TV, coffee maker, refrigerator, microwave, hair dryer, iron and ironing board. Also, earn rewards including free nights and gift cards with our Choice Privileges Rewards program. Pet Accommodation 20.00 USD Per Night and Per Pet. Pet limit: A maximum of 25 pounds, and 2 pets per room. A 25-foot-long giant chain sags in the air between two downtown Columbia office buildings. Unveiled in 2000. A work of art by artist Blue Sky that signifies something, possibly.